During the fight over Michigan becoming a right-to-work state President Obama said that the law was really "a race to the bottom" and "the right to work for less money." The President's comments joined a chorus of similar statements from labor executives and critics of right-to-work laws. But a look at income growth since 1990 shows that right-to-work states are significantly outpacing non-right-to-work states, according to data from the U.S. Census Bureau. From 1990-2012 (the latest year data is available), right-to-work states made up 13 of the 20 states with the fastest median household income growth. Of the 15 states that had slower income growth than the national average, which was negative growth overall adjusted for inflation, 10 of them were non-right-to-work states during that period. Dr. Brian Long, the director of supply management research at Grand Valley State University, is not surprised by the data. "You hear the argument that right to work is the 'right to work for less' – but the evidence doesn’t show that. And when you consider cost of living, right-to-work states are doing even better," Dr. Long said. "Business development people have told me that 2/3rds of major companies would not even look at Michigan when it was not a right-to-work state. Now that we are, there have been a lot of inquiries." Tim Bartik, a senior economist with the Upjohn Institute for Employment Research in Kalamazoo, said to the Detroit Free Press in December 2012: "I think the relevant issue that people should be asking themselves about right-to-work is what impact does it have on employment and what impact does it have on wages. And both of those questions are important." If those are the important questions, an analysis of the date for the past quarter century shows right-to-work states doing much better than non-right-to-work states. But Bartik believes the comparison is too simple. "The problem is that there are many differences between all these states in factors affecting economic growth," he said. "And in order to infer causation from correlation, one has to hold constant other factors affecting economic growth, which is hard to do." In a piece for the Center for Michigan, Bartik looked at much of the research on the issue and found it to be mixed, but with "downside risks." "For the last 50 years, right-to-work has mostly been in the same Southern (and some Western) states," he wrote. 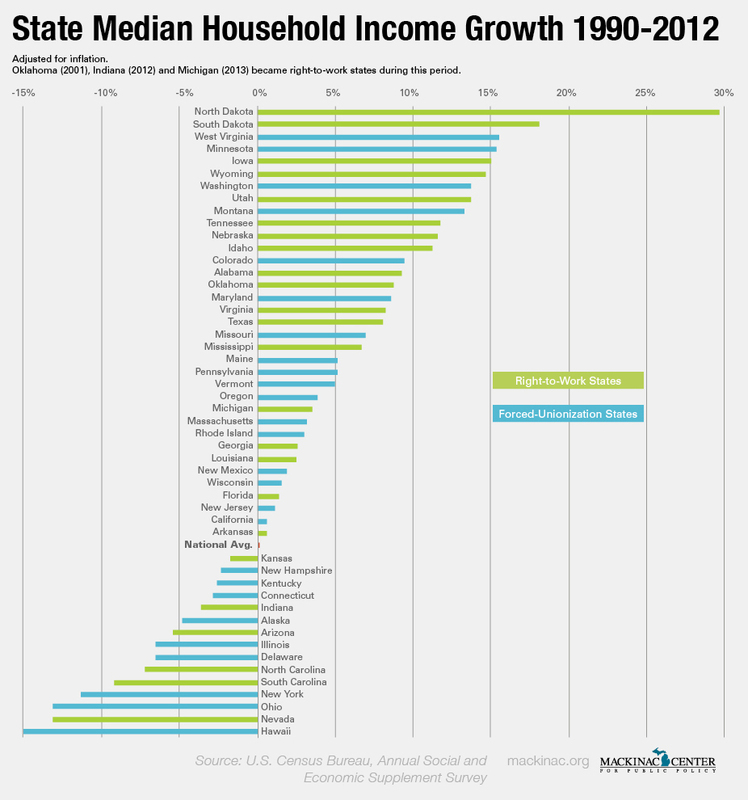 "Southern states have had faster job and wage growth than the North. But is this due to right-to-work, or other Southern characteristics? That is hard to say. Southern states also have lower wages than the North. But whether this is due to right-to-work is also hard to say." A 2013 study by Michael J. Hicks, a professor at Ball State University who also is on the Board of Scholars for the Mackinac Center for Public Policy, and Michael LaFaive, director of the Morey Fiscal Policy Initiative for the Mackinac Center, used an economic model designed to overcome research challenges that have beset other scholarly analyses by breaking up the data into four distinct time periods and by controlling for "reverse causation." That is, by teasing out the impact of economic growth that might correlate with the passage of right-to-work laws, they were able to better discern the true impact on a state. The study found that right-to-work laws boosted average real personal income growth by 0.8 percentage points from 1947 through 2011. That may not sound like much, but if a state would have otherwise grown at 2 percent adding another 0.8 percent is a 40 percent improvement in its growth rate. A similar previous analysis looked at federal government data over the same time period for job growth. Right-to-work states average job growth at twice the rate of non-right-to-work states. Right-to-work states made up eight of the top 10 states for employment growth while non-right-to-work states made up all 10 of the states with the slowest growth.